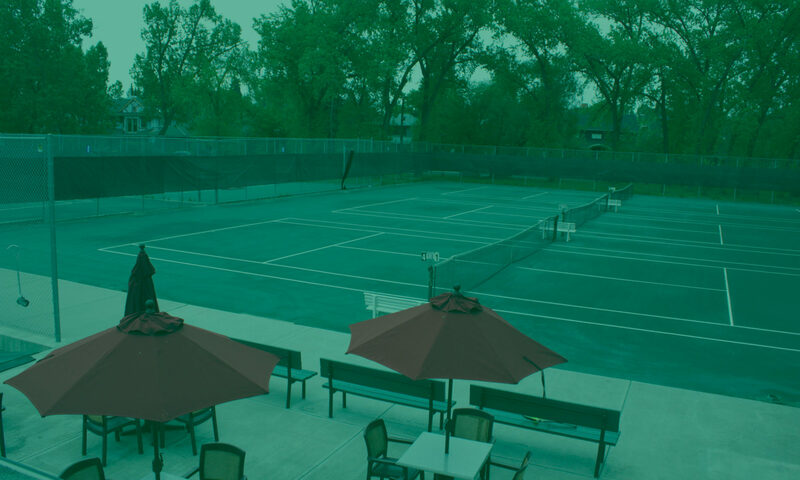 Elbow Park Tennis Club is a great place to spend the warmer seasons in Calgary. Not only do members enjoy our welcoming community and serene location, but our guest policy lets you bring along a friend to enjoy it with. It’s a fun way for kids to get out of the house and be active, and our programming is perfect for skill sets of all levels. Throughout the outdoor tennis season, the calendar at Elbow Park Tennis Club is filled with lessons, clinics, tournaments, and events that allow Members to meet and network. The courts are maintained and watered regularly, offering the optimal clay court feel. *Individuals who have a 2019 Elbow Park Residents Association (EPRA) sports membership will receive a $35 discount. This applies to the single adult, couple and family rates only. This reduction does not apply to The Glencoe Member rate. The above rates include GST. Guests are welcome when accompanied by a club member. Any Calgary resident guest is limited to six visits per season. Guests must be registered, with the fee paid BEFORE COMMENCING PLAY. Please sign in EACH time you play. Please wear proper tennis clothing. Please refer to the Dress Code. To ensure maximum playing enjoyment, courts are maintained throughout the day. We appreciate your patience with the attendant. Please follow the rules of etiquette as posted. Court 3 & 4 will be available for lessons at all times. If no lessons are booked, Court 4 will be available for general play. Juniors (17 & under) may play BEFORE 5 pm on WEEKDAYS. Weekends and statutory holidays, juniors cannot play before 2 pm. Juniors may NOT play alone if adults are waiting. Juniors playing with adults may play at any time. Guests are welcome when accompanied by a club member. Any Calgary resident guest is limited to six visits per season (inclusive of any 5-Play passes). Guests must be registered, with the fee paid, BEFORE COMMENCING PLAY. The Clubhouse is open to members of the Elbow Park Residents Association and their children as well as the tennis club members. Proper behaviour and courteous conduct is expected at all times, when on the premises. All courts are booked for a half hour. When the time limit is up, players may be bumped from a court even when additional courts are available. The Elbow Park Tennis Club has a dress code that requires proper tennis attire. White or coloured tennis clothing is acceptable. Proper tennis attire for men includes: tennis shirt or t-shirt. Tank tops & cutoffs, etc. are NOT proper attire. Please ensure that you wear proper tennis attire when playing on the courts. Proper tennis attire for women includes: shorts, shirts, t- shirts, dresses, skirts. Swimsuit tops, cutoffs, etc. are NOT proper attire. Please ensure that you wear proper tennis attire when playing on the courts. Proper tennis shoes MUST be worn on the clay courts. No jogging shoes, please. The Har-Tru surface is sensitive to corrugations, deep ridges, etc. If you are unsure, please speak to the managers. It is your responsibility to inform your guests of all the rules, especially the dress code. If guests are not properly attired or not wearing suitable footwear, they will not be allowed to play. A proper dress code keeps with Elbow Park Tennis Club’s long-standing tradition and will be strictly enforced. A proper dress code keeps with Elbow Park Tennis Club’s long-standing tradition and will be strictly enforced. Please wait for the point in play to end before walking behind any of the courts. If you are returning a ball to another court, please make sure they are aware before you hit it. This is both courteous and safe. If your ball rolls on to another court, please wait for them to return it (after their point has ended). Please complete games already in play before joining a pre-arranged match. Seasoned members: please encourage new members to join your games (you were once a new member too). Please abide by the NEW and IMPROVED Court Board Rules. This ensures maximum court time for everyone. The club has NO child supervision facilities and cannot be responsible for your children while you play tennis. Therefore, please ensure that your children are supervised at all times. These rules are meant to make everyone’s time at the ELBOW TENNIS PARK CLUB as enjoyable as possible. Thank you for observing them.